Wolfsburg's Junior Malanda has died aged 20 in a car crash in Germany. The Belgium Under-21 midfielder had made 15 appearances for the German Bundesliga side this season, including against Everton in the Europa League. Wolfsburg sporting director Klaus Allofs said in a statement: "We are all deeply saddened and our disbelief can hardly be put into words. "We can't believe he is no longer with us. Our thoughts at this difficult time are with his family and loved ones." Allofs added: "He was the good spirit of our team and a fun-loving person. In addition, Junior was an excellent football player who was only at the very beginning of his development." Malanda was linked to Fulham and Crystal Palace when he left Zulte Waregem in 2013 but instead joined Wolfsburg, before going back on loan to the Belgian side. His last game was a 2-1 win over Cologne on 20 December. 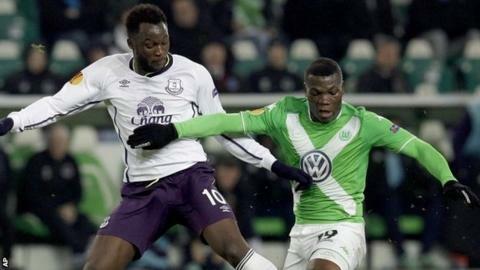 Wolfsburg police said Malanda was killed when he was a passenger in a car that crashed on a motorway near the German city of Bielefeld on Saturday. He was en route to meet up with his team-mates to fly out to South Africa for a training camp. Wolfsburg had postponed their departure to Cape Town on Saturday but have decided to fly out on Sunday. "It was no easy decision," Allofs said. "This would also have been in the spirit of Junior. "We want to keep going, professionally, also for him. We will meet with fans [on Sunday] and say goodbye together." Wolfsburg team-mate Kevin de Bruyne wrote on social media: "So strange to hear your friend in the morning and then hear this news. Lost a great friend way too early. RIP my friend. You will always be around." Another team-mate, Nicklas Bendtner, said: "Not only a great player, but a great person. My thoughts and prayers will always be with you and your family brother. Your kind heart was rare and special. You will always be remembered." Chelsea's Thorgan Hazard, who played with Malanda at Zulte Waregem, said: "Whyyyyy??? I love you brooo." Everton and Belgium striker Romelu Lukaku said: "I love you my brother. "Junior, why you are my brother….my brother, one of my only and unique friends, I cannot believe you are not there anymore." Malanda's fellow Belgian Thibaut Courtois, the Chelsea goalkeeper, said: "RIP @JuniorMalanda!! We lose a huge talent and a great person!!" The Royal Belgian Football Association wrote: "The world of football has lost a great talent today. URBSFA sends its condolences to his family & friends #ripmalanda." Bayern Munich and Germany midfielder Mario Gotze said: "RIP Junior #Malanda - sooo sad! My thoughts are with your family and friends...!" Belgium midfielder Axel Witsel, Bayern Munich defender Jerome Boateng, Monaco midfielder Geoffrey Kondogbia and Paris St-Germain left-back Lucas Digne ‏were also among the other players to use social media to send their condolences. "I talked several times to the Wolfsburg manager who said he is a very promising player and he hoped he'd be a very strong player within the Wolfsburg team. Wolfsburg are second in the league, they've got a very strong squad and for Junior Malanda it was a very difficult task to get in the starting 11. But he had a long-term contract and a brilliant future."